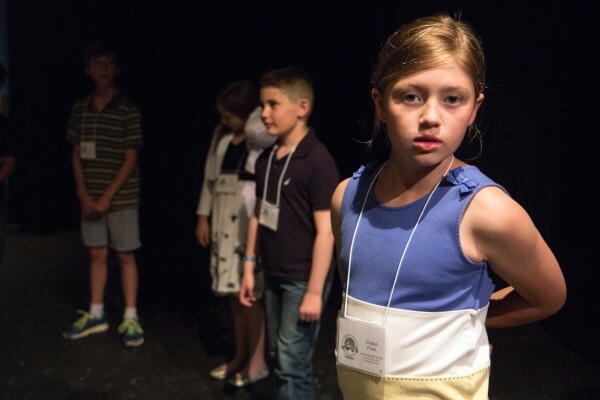 After volunteer judges Jim Carroll, Mureall Hebert, Lisa Kois, Jo Meador, Helen Sears, and Katie Woodzick evaluated and provided personalized feedback on each entry, Whidbey Children’s Theater (WCT) board member Carolyn Tamler tallied scores and notified winners. 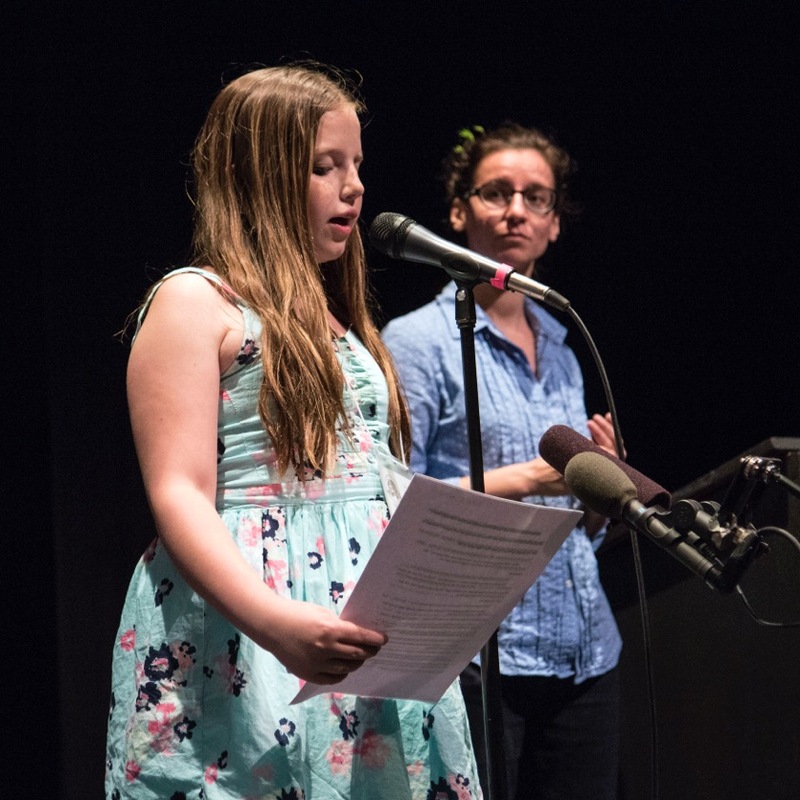 It was Tamler who encouraged WIWA to collaborate with WCT, where winners read their work aloud at an award ceremony on Saturday, May 30. 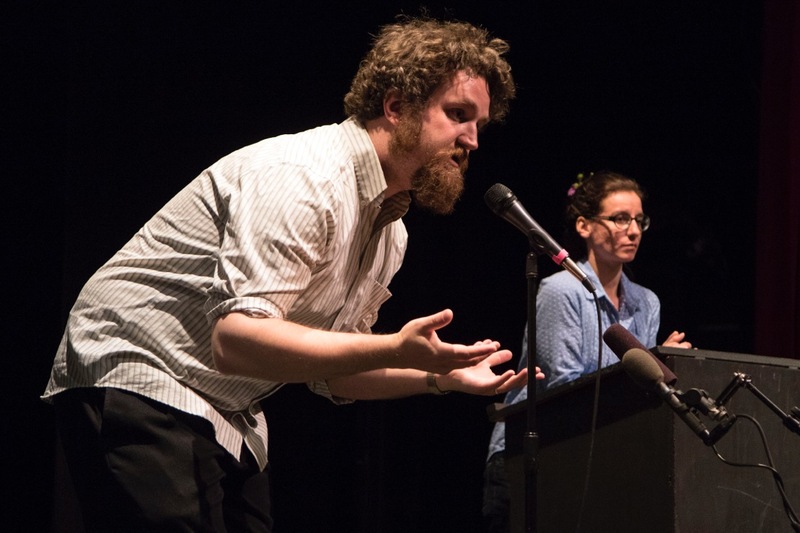 Before the presentation, WCT staffers Michael and Kathryn Morgen coached winners in performing their work, making both the stage and microphone feel like much friendlier places. 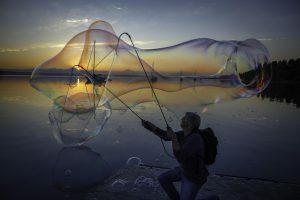 Photographer David Welton represented Whidbey Life Magazine, the third organization to participate in this collaboration, and took the photos you see here as winners worked with Michael and Kathryn. Videographer Robbie Cribbs represented WhidbeyTV, the fourth organization, and recorded winners as they presented. Annie Horton and Mary Rose Anderson of Whidbey Air Radio represent the fifth collaborating organization; they will record winners as they read their work at the KWPA studio in Coupeville later this month. The staff of the Northwest Institute of Literary Arts (of which WIWA is a program) is proud of all the students who entered the Celebrate Writing Contest, whether they won or not, and is deeply grateful for the dedication and support of Whidbey Island parents, teachers, judges, volunteers from all the collaborating organizations, and the organizations themselves: Whidbey Children’s Theater, Whidbey Life Magazine, WhidbeyTV, and Whidbey Air Radio. Each week in June Whidbey Life Magazine is publishing the winners of this year’s contest in a special Celebrate Writing section. 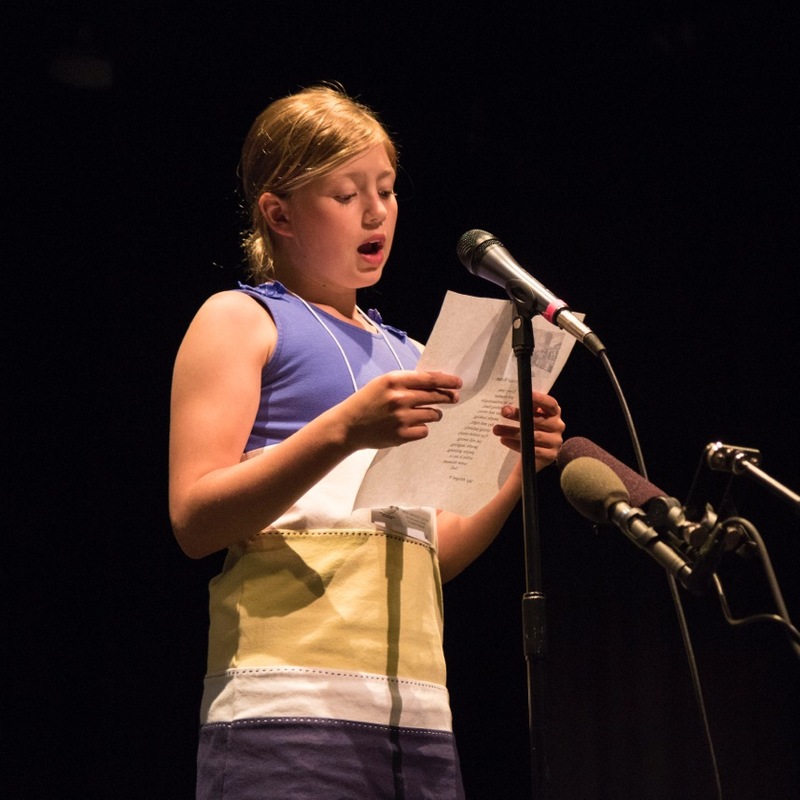 This week, the second week, showcases the talents of some of the Second Prize winners for poetry and short fiction. Look for the more second and third place winners in both categories in the last two weeks of June. To read the First Prize winners, visit here. 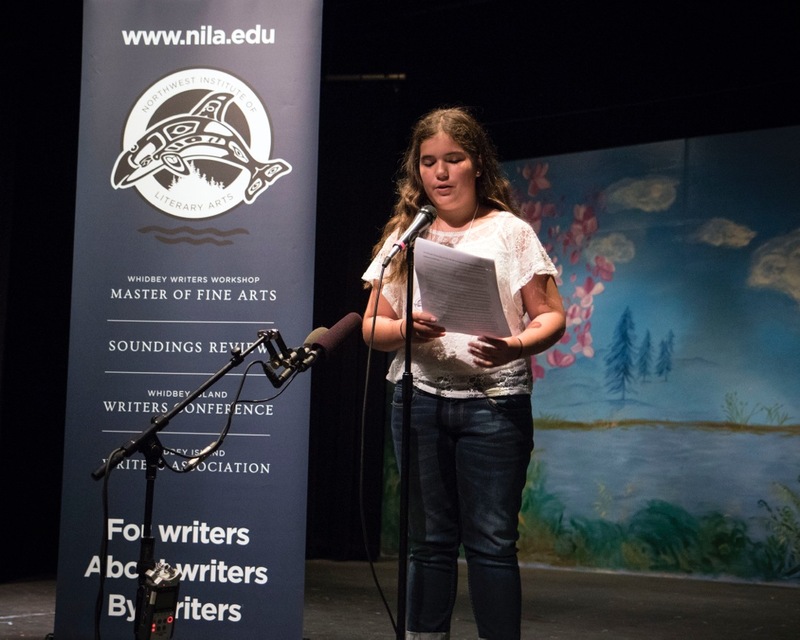 For information about the next Celebrate Writing Contest, keep an eye on wiwa.nila.edu. It is very calming too. Bethany O’Brachtol backed further into the shadows of the abandoned cellar. Her vivid green eyes swept the room looking, searching desperately for The Thing. She didn’t know why she was down here or what she was looking for. All she knew was that she had had a strange dream telling her to go there. Bethany brushed her long auburn hair out of her eyes. What had her dream said again? Of course, you don’t know. I will tell you. The woman in her dreams was beautiful, with lush red hair, melted chocolate eyes and marble skin. Her lips were a soft cherry red and her long graceful fingers drummed absentmindedly on her thin leg. She would have been a supermodel in our time or a king’s wife in Bethany’s time if not for the huge gash in her chest right where her heart was. When Bethany’s eyes fell upon the wound, she forgot all politeness and exclaimed, “Good Lord, what happened to ye?! Have ye been skewered by a spear or run through by a dagger? !” (Of course this wasn’t entirely surprising, as Bethany was a Scotswoman and a very brash one at that.) The woman smiled gently but did not answer. Bethany gaped at the wound in horror and finally realized what she was doing about ten minutes later. She hastily apologized and directed her eyes to the maiden’s face. “Bethany” The lady spoke and her voice was like butter. Suddenly, she vanished, leaving Bethany with a door in the side of the Great Hall (She inherited her mansion, with about 150 rooms, after her parents died 15 years ago, when she was 3). She stepped through it and woke up, not in her bed, but standing in the middle of the Great Hall, facing that same door. She yelped and fell on the floor out of pure surprise. What was that? She could have sworn she had heard a gentle laugh much like the woman’s. Bethany shook off the feeling (with a spot of tea at the table) and stared intensely at the door. What was behind there? Why was the door itself there? Should she go in it? All these questions and many more floated about her mind. Finally, she got up from the table, threw open the door, stepped inside with her eyes closed, and nearly fell down the steep set of stairs. Thankfully she caught herself. She slowly picked her way down the rickety staircase, freezing every time she heard a noise. When she got to the bottom, she looked around the room and noticed a rusty handle sticking out from underneath a pile of papers. Bethany picked it up and the second her fingers touched the thing, a cold so cold it was hot, coursed through her body. She shouted and heard that same laugh again. The room swam before her. Suddenly, the same woman from her dreams materialized in front of her…. Except, she had no gash and her features were more whole. She was stitching up a rip in a dress and sitting on a stool. All was calm. Then, Bethany heard a sound like someone picking a lock… no. It couldn’t be. But it was! The door burst open and a man with a wild black beard and scared looking blue eyes ran in, holding a wickedly sharp knife in his right hand and the very same key that Bethany had in his left. The lady was so shocked that all she did was freeze and drop her stitching. Quicker than a blink of an eye, the man rushed forward and plunged the dagger into the girl’s heart. He tugged it out, chanted an ancient spell, pulled out the decorative ruby, crushed it, and then killed himself. The maiden was still lying on the floor, raggedly drawing in her last breaths while her blood soaked through the rug and through the floorboards. And she died. The cooks downstairs had been frightened out of their wits, what with the blood soaking through the floorboards and dripping into the food. Footsteps pounded up the stairs and as soon as the eyes of the staff fell on the dead bodies, wailing and crying broke out. The mistress of the house pushed the staff out of the way and collapsed on the girl’s body, sobbing. Once the door was sealed (the master had decreed that the bodies not be moved), a dark feeling covered the manor, and caused the candles to cast ominous shadows along the wall. Drapes closed on the windows and blocked out the sunlight. The vision abruptly ceased and once more, a door appeared in front of Bethany. But, instead of opening when her hand touched it, it remained locked. “Of course! The key!” she exclaimed to herself. Cautiously, she put the key against the lock, pushed and turned. It opened. Bethany held her breath and stepped through the threshold. She found herself in the exact room that the woman had died in, and to prove her point, two skeletons lay on the floor. One had the dagger still encased in its ribcage, and the other had three shards of a ruby lying next to it. Out of the blue, Bethany found a very strong urge to take that ancient dagger and plunge it into her stomach! The next thing she knew, she was raising the dagger up in the air ready to kill. Just in the nick of time, she thrust her hand to the side of her arm and cut it. ‘Well, it was better than my heart or gut.’ She thought. Suddenly, she was forced to drop the dagger because of its burning heat! The dagger was actually giving off blazing light and filling the room with uncomfortable warmth. Bethany glanced over to the gem fragments and saw that they were glowing too! The heat was becoming nearly unbearable now and Bethany desperately looked for a solution. Letting her instincts take over, she closed her eyes and grabbed the jewel fragments. Scorching heat met her fingertips and immediately, they began to blacken. She screamed and red light poured out her mouth as she slammed the shards together and pushed the whole jewel into the dagger. All at once, everything stopped. The temperature went back to normal and the dagger stopped glowing. Candles lit themselves and instead of casting the usual foreboding shadows, their flames crackled merrily. The drapes flew open and warm sunlight flooded in .Birds sang cheerily in the trees and fish jumped in the pond. Bethany had no idea what to ask until she remembered the suicide part. Bethany then knew exactly what to wish for. Then she vanished. Bethany walked back to the Great Hall in a trance. She couldn’t wait to see her parents! When would she leave? Now? She ran to the hall and let out a whoop of joy. The portal was here! Only one thing left to do. Wipe everyone’s memories and cast an everlasting Disillusionment Charm. She did so and stepped through the portal, not even taking a last look around. The next thing she knew, she was in her parents’ warm embrace, tears of joy streaming down their faces. In my deep sleep, I could smell a vanilla and black coffee scent of an iced vanilla latte. I breathed in the fresh scent as I stretched and then realized I was awake and that smell was real. I threw off the covers and hurried out of bed wondering if my favorite drink was waiting for me. My mom had gone to her coffee shop, the Sassy Sweet Coffee Shop, to get me a latte and to check up on her employees. As I rounded the corner into the kitchen, I saw it. A tall plastic cup with water dripping down the sides and a mound of white whipped cream on top of ice cubes swimming in a sea of brown, creamy liquid. It was topped off with a hot pink straw. It was an iced cold vanilla latte just for me. Mom was making French toast; her beautiful red hair was covering her face. “Good morning Mom,” I said as I eyed the drink. “Well good morning Grace Lenore Smith. I was wondering if today you would like to go to the shop with me.” Mom declared as she flipped the toast onto a plate. Mom’s coffee shop; the best place on earth! Rows of bagels, a refrigerator full of cans of spray whipped cream, and the smell of coffee. I have loved the shop since I was 8 years old. It has been the most important comfy place I could ever want or could ever be. Maybe it is because Mom is always there. “Yes of course! You don’t have to ask me twice.” I exclaimed. “Ok sounds good be ready by 10,” Mom insisted. I ran to my bedroom to pick out the perfect outfit. Looking in my closet, I found a black tank top, white sweater, and long black leggings. I fixed my blond hair into a French braid that cascaded down my back and put some Loreal mascara on my stubby eyelashes. The clock said 9:58 and I threw on my favorite, well-worn combat boots and bolted down the stairs. I threw myself into the front seat of the blue Toyota and whipped on the seat belt. Mom started explaining that I was basically going to run the cash register for her. I answered with, “I’m only 13!” I had no desire to run the cash register because one could mess up really easy and I didn’t enjoy messing up. Mom laughed and said “I know, but I want you to learn for the future.” But really, I had no clue what I wanted to do in my future. When we arrived at the shop, I hopped out of the car and smelled the aroma of all the different coffee blends. I walked into the big room filled with many people of different ages. Some were occasional customers but many were long-time customers that I had known since I was 8. Mom was right behind me. Mom and one of her employees, Jessa, taught me how to run the big glistening cash register. I got some of the particulars but not all! I always messed up and had to look at our menu seeing if what they ordered was actually a drink. Looking at her funny I just said, “Ok…. that will be $3.73”. “What? That’s way too much for a 16 oz. iced vanilla latte with extra ice,” she complained. Not wanting to make yet another mistake, I sighed and said, “Hold on, I’ll ask my mom.” When I went back to Mom she said I was actually right! The girl just strutted back out and didn’t buy anything. Then a creepy looking guy dressed in all black with a metallic scooter came in and my heart stopped as he came up at the very edge of the counter. Looking at him, he had a black shiny gun, he pointed it at me as I almost passed out and he said “Give me the money.” I gave him twelve of the one-hundred dollar bills and out the door he went. My mom was so shaken up she almost passed out too. Being honest I was scared and shaken up too. Mom said that I probably shouldn’t run the cash register anymore. I said that was a good idea. When the creepy guy pulled out the gun Jessa called 911 and the cops showed up. The cops found the guy who stole the money and he went to jail. The twelve hundred dollars was returned to the shop and everybody was happy well except Jose Lee Cape who was behind bars. While I was running the cash register I managed to learn how to make an iced vanilla latte with whipped cream on top! 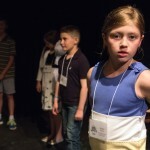 All photos were taken by David Welton during the rehearsal and coaching session preceding the event. 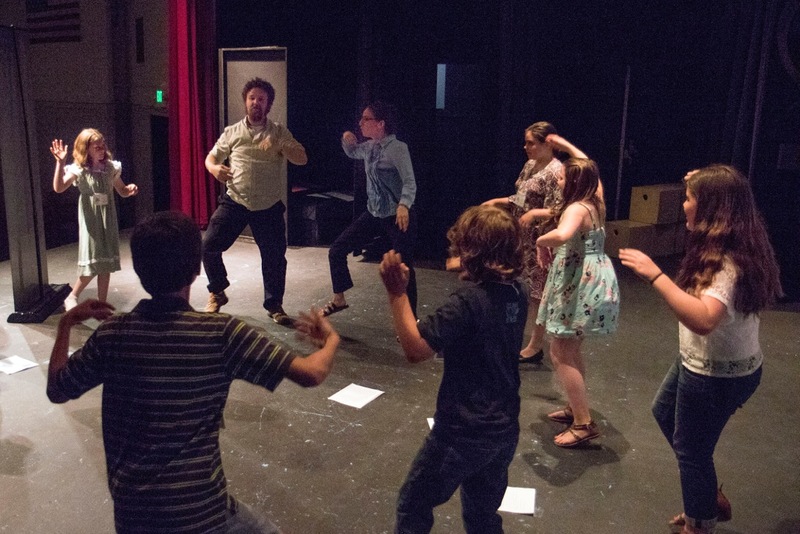 Coaching was provided by Michael Morgen and Kathryn Lynn Morgen of the Whidbey Children’s Theater.